Why and how did you become an antiques dealer? I discovered the world of antiques through my love of metal detecting. My parents had a farm in Derbyshire and, as a young boy, I’d set off with my metal detector across the fields. One day, I found a Charles I penny dating back to 1633. I was fascinated – and hooked. I thought, ‘Who has held this? If this object could talk, what could it tell me? The rest, as they say, is history – and history and antiques have been my life ever since. Are you a collector of anything unusual? I confess, I do buy quite a few antiques. I have a passion for ceramics and love old postcards, but I suppose my biggest love is antiquities. I still go metal detecting. Which has been you favourite location in the UK for a spot of antique hunting? I have to say my beloved Derbyshire, my home county and where it all began. What would you consider to be your greatest find to date? Apart from my wonderful wife, Rebecca, my biggest find to date was a blue and white Chinese Qianlong vase which sold for £650,000. It was found in the West Midlands and had been used as a doorstop for 36 years. Can you recall the most unusual object you’ve been asked to value or auction? There have been many but one surprise was toe bones. 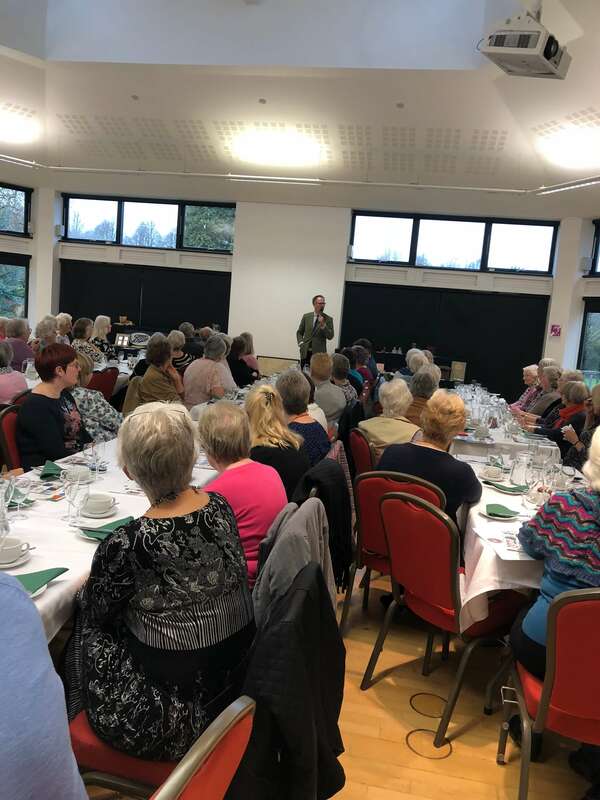 They were among cannon balls, flints and musket balls unearthed in gardens in Lutterworth, Leicestershire – possibly from the 1645 battle of Naseby. The finds were made by someone clearing their vegetable patch in Lutterworth. Another weird and wonderful item was a miniature dog in a glass dome. In 2012 we sold a piece of toast said to have come from Prince Charles’s breakfast on the day he married Princess Diana. It fetched £230. Have you ever broken anything that’s worth a great deal of money? I think the less said here the better but, suffice to say, there has been the odd mishap. Would you say it’s now more difficult to find Antiques Roadshow gold in charity shops, at car boot sales etc, and that we’re all a bit savvier with prices? No – the finds are still out there. We uncover something unusual every day. I never cease to be amazed. Car boots, flea markets, antique fairs and charity shops are still good hunting grounds. In the last year, we’ve sold a single antique glass found for 99p in a charity shop for £160, a gold mirror that was being thrown out for £300 and a ring labelled ‘junk jewellery’ turned out to be a gold diamond ring. The finder paid £5 for it. People may be savvier with prices but there are always things that slip through the net. What’s the current fashion in antiques? It changes all the time but militaria items are in hot demand as are vintage toys, fired by the nostalgia of our childhoods in the 1950s or 1960s. What would your top three tips to our readers be regarding what to look out for when buying antiques? Make sure it’s not broken or restored. Avoid reproductions – and check there’s no barcode on the bottom! Do you have any final words of advice to any budding antiques experts out there? If you think something is of value, seek out an expert in that field. And don’t dismiss an item as worthless. You never stop learning. 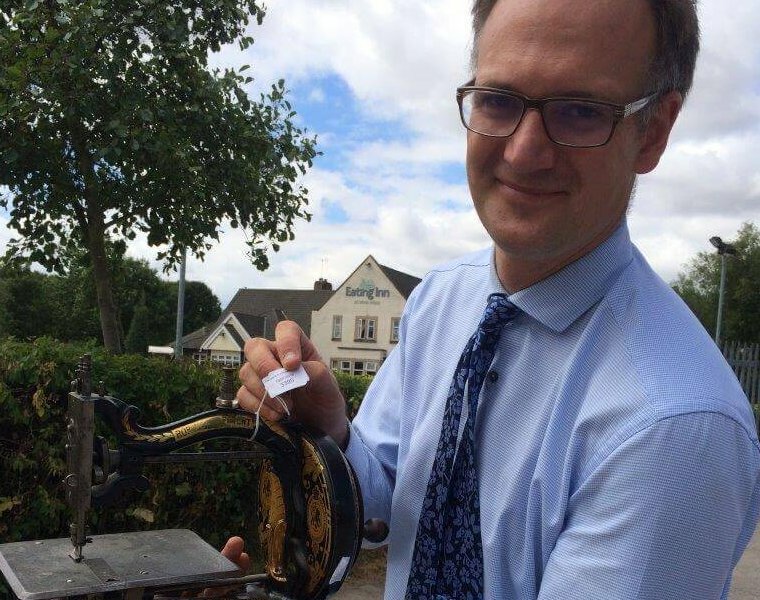 This year, an antique sewing machine sold for £2,000 from an estimate of less than £60-£80. Another surprise lot was a huge collection of old CDs that fetched more than £2,000. Though some CDs are worthless, the vendor told us very rare CDs could fetch major prices online. One name he mentioned was Cliff Richard! Do your research and you know where I am if you need a valuation! 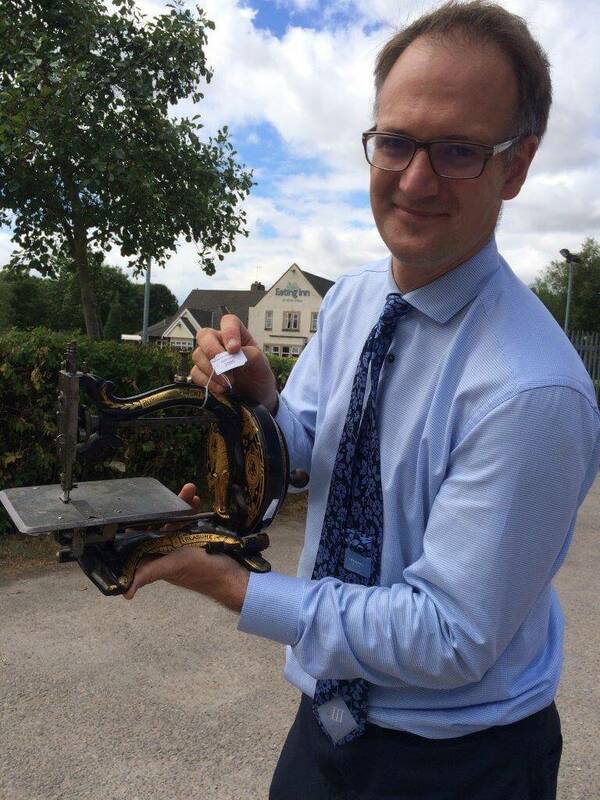 Charles Hanson with ‘The Family Treasure’ Owen Robinson and Co sewing machine, circa 1874. It sold for £2,000. The total price with buyer fees and VAT was £2,480.